Inter-disciplinary	approach – collaboration among	academic disciplines is required for	tackling	complex environmental	problems on sustainability of	earth	system and human	beings,	including resource	depletion,	poverty	issue, degradation	of	biodiversity, and addressing climate change	and	mega disasters. Such	collaboration requires effective work with so called Big	Data,	which is	a common term for large volumes and large variety of data	and information. Presently, innovative technologies are being	developed	to	facilitate sharing	and	exploitation of Big Data for addressing the abovementioned issues, with	the Data Integration and Analysis System	(DIAS) of	Japan being an example,	which is	now	ready for practical use. Developed and conducted a class aiming to acquire knowledge as well as analysis technique of Environmental Impact Assessment (EIA) and Geographical Information System (GIS) through practical lectures and hands-on exercises on watershed environmental management using the Mekong River basin as a study area. The class of 2012 had become the largest in AIT attended by 57 that resulted in a great shortage of the number of software’s license to be used in the class. Environmental Systems Research Institute, Inc. (Esri) provided GIS software licenses upon request for a donation. 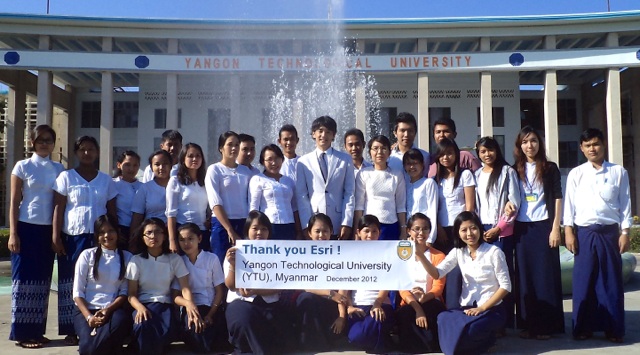 Designed and provided special lecture series at Yangon Technological University (YTU) with other 7 faculties of Institute of Industrial Science (IIS), The University of Tokyo, to support a renewing of education and research activities after shifting to civilian rule of the country. The class titled "Introduction to GIS" was conducted as a part of the lectures. Developed and conducted computer exercise-based lectures with 3 faculties from The University of Tokyo to provide theories and basic techniques of Remote Sensing and GIS. Designed and conducted as a part of the program, Education for Sustainable Development (ESD), organized by Yokohama National University and United Nations University Institute of Advanced Studies (UNU-IAS). Designed a practical lecture and provided two regular lectures for graduate students from 2002 to 2006 with participation of over 400 graduate students. The contents of the lectures were summarized into three books and published more than 20,000 copies to date. The books have been used not only as a textbook or a reference book at over 30 classes in various universities but also as a self-education book for working-level at private sectors and local governments in Japan. GIS and Environmental Management, ES 165: Introduction to Environmental Engineering (Prof. Rogers), School of Engineering and Applied Sciences, Harvard University, Cambridge, USA. Mar. 8, 2010. Tools for Monitoring Climate and Other Environmental Processes of Earth, ES 6: Environmental Science and Technology (Prof. Martin), School of Engineering and Applied Sciences, Harvard University, Cambridge, USA. Mar. 31, 2009. GIS and Environmental Management, ES 165: Introduction to Environmental Engineering (Prof. Rogers), School of Engineering and Applied Sciences, Harvard University, Cambridge, USA. Mar. 11, 2009. Multivariate analysis: Remote Sensing, Government 1016: Spatial Models (Dr. Srinivasan), John F. Kennedy School of Government, Harvard University, Cambridge, USA. Feb. 25, 2009. Tools for Monitoring the Environmental Processes of Earth: Satellites, ES 6: Environmental Science and Technology (Prof. Rogers), School of Engineering and Applied Sciences, Harvard University, Cambridge, USA. Apr. 10, 2008. Developing an integrated water infrastructure geodatabase. UNU-AIT capacity development program of the "Extreme Flood Risk Management" training course. Asian Institute of Technology, Bangkok, Thailand. Nov. 15, 2007. Developing Integrated Water Infrastructure Geodatabase. Disaster management program, Brac University, Dahka, Bangladesh, Dec. 11, 2007. GIS in environmental management research in Japan. Second EABRN GIS training course for Biosphere Reserve management in East Asia, UNESCO Man and the Biosphere Programme (MAB), Chinese Academy of Science, Beijing, China. Dec. 4, 2006. Utilization of Spatial Information in Environmental Study. Special class for Aoyama Gakuin Women’s Junior College, United Nations University, Tokyo, Japan. Jun. 17 and Dec. 17, 2007. GIS for Irrigation Planning (24 hrs lecture and exercise), June 27-30, 2011 at FAO capacity development course "GIS and Remote Sensing in Irrigation Planning" for Afghan delegates, Asian Institute of Technology, June 6 - July 1, 2011. Introduction to GIS for Watershed Management (6 hrs lecture), June 6th, 2011 at UNESCAP capacity development course "Integrated Watershed Management and Reforestation" for DPRK delegates, Asian Institute of Technology, May 16 - June 10, 2011. GIS as a tool for environmental problem solving (18 hours lecture and exercise), Postgraduate Programme "Building Resilience to Climate Change", United Nations University Institute for Sustainability and Peace, Sep 27-30, 2010 and Mar 21-24, 2011.